The Rebuild command reconstructs selected curves or surfaces to a specified degree and control point number. Select the curves or surfaces. Click Preview to see what the rebuilt curves will look like. When you are satisfied with the results, click OK. 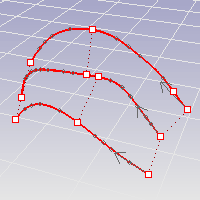 Turn on control points and curvature graph to see the details of the curve structure. A group of curves will be rebuilt with curves of a specified degree and specified number of control points. The knot of the resulting curve more evenly spaced. To rebuild a curve with uneven knot spacing but a more accurate fit, use the FitCrv command. Reports in parentheses the current number and sets the number of control points in the result. Reports in parentheses the current number and sets the degree of the curve. Creates the new objects on the current layer. Clear this check box to place the new objects on the layer of the original curves. Reports the maximum deviation from the original curve when Preview is clicked. Type a hyphen in front of the command name: -Rebuild. Select a curve to use as a template for setting the point count and degree. Click Preview to see what the rebuilt surfaces will look like. Reports in parentheses the current number and sets the number of points in the u direction. Reports in parentheses the current number and sets the number of points in the v direction. Reports in parentheses the current number and sets the degree in the u direction. Reports in parentheses the current number and sets the degree in the v direction. Creates the new surfaces on the current layer. Clear this checkbox to place the new surfaces on the layer of the original surfaces. Trims the rebuilt surface with the original trimming curves. Reports the maximum deviation from the original surface. The calculation tests how far away the new surface is at knot line intersections and half-way between knot lines. Conducts tests at knot line intersections and halfway between knot lines. The display color indicates how far away the new surface is from the original. Points are green if the surface is within absolute tolerance, yellow if it is between tolerance and 10 times tolerance, and red if it is farther away than that. The RebuildUV command reconstructs selected surfaces to a specified control point number in either the u or v directions independently. Specifies the number of control points in the result. The surface control points are created at the same locations as the control points of the original. This is a good option if the control points will be edited later. The surface has an average amount of stretching between the curves. This is a good choice when the curves are proceeding in a relatively straight path or there is a lot of space between the curves. Creates a ruled surface. The sections between the curves are straight. The surface closely follows the original. This is a good choice when the input curves are going around a corner. Makes the object knot vectors uniform. The RebuildCrvNonUniform command interactively modifies selected curves by non-uniformly re-spacing the control points. Drag the points on the curves. Click the direction arrows to reverse the curve direction. Specifies the maximum distance the rebuilt curves can deviate from the originals. If you do not provide enough control points, the rebuilt curves may deviate more than RequestedTolerance from the originals. The maximum deviation from the original curves is reported at the command line and marked with a point on the curve. Specifies the maximum number of control points per curve used to rebuild. Displays two more controls along each curve to influence how the RebuildCrvNonUniform command distributes control points. The controls at the end of the curves can be used to shorten the resulting curves. Resets the editing points to their original locations.